Hindu God Shiva wears two earrings or Kundalas. Traditional images of Shiva depict the two earrings named - Alakshya and Niranjan. Alakshya is believed to be one that cannot be shown by any sign – perhaps suggesting that the Supreme Truth (Shiva) cannot be captured in any form. Niranjan is said to be one that cannot be seen by mortal eyes. The Supreme Truth cannot be grasped by human eyes, we can only see parts of it and what we see is the tiniest of the tiniest drop in the ocean of bliss. 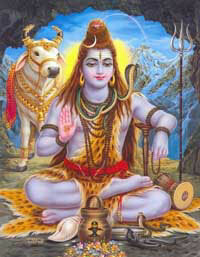 Symbolically, Alakshya and Niranjan suggest that Shiva is beyond ordinary perception. In traditional images, the earring on Shiva’s left ear is one that is worn by women. The earring that is on the right ear is the one that is worn by men. Thus the two earrings also symbolize Shiva and Shakti – the Ardanarishwara form of Shiva.